I love Henry Frayne. There, I said it. I know it can sometimes be difficult for men to express their emotions, but Mr Frayne (and to some extent Leo Abrahams) occupies a place in my heart labelled “Underrated Guitarists that I empathise with”. I first encountered Frayne and his band Lanterna, which is really just him and a drummer friend, while perusing the eMusic website about five years ago. The first album I heard “Elm Street” instantly captivated me and I realised I had found something special and ever since that time I have followed the Lanterna sound. This new album isn’t scheduled for release until March but I ordered mine direct from Badman Recordings and got it early. What annoys me abotu Frayne is how can this guy continue to produce consisitently good albums in such a short period of time. It’s bugging me! But seriously, prolific must be Frayne’s middle name. This new album serves up more of the same, and that’s not a bad thing, if like me you enjoy epic, cinematic, instrumental guitar music. Lanterna’s sound is that of a the simple soul. Optimistic, panoramic, sunny, the road leading to the horizon: that’s the best way to express what I hear and feel when I listen to a Lanterna album. Of course, this music isn’t for everyone because some would consider it “fey” or too simplistic to rate him as a guitarist because he doesn’t play a million notes a minute. What he does play is considered and from the heart. There’s driving delayed rhythm guitars that don’t sound a million miles away from U2, gentle acoustics thrumming with Frayne humming, one track almost sounds like the extended solo Brian May from Queen used to play during “Brighton Rock”, steady drumming from long-time collaborator Eric Gebow and 10 tracks that will transport you off to the heartlands of America. The album is expansive, panoramic and begging to be used in a movie soundtrack. If you want a record to banish the winter blues, then look no further as I guarantee this will remind of the summer sun and blue skies that await us. 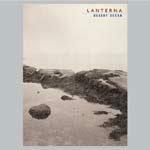 And if you aren’t familiar with the music of Lanterna, this ten track album represents probably the best introduction. Buy it now (and don’t forget to buy a copy of Leo Abrahams’ “Honeytrap” album too). Alternatively, get a free trial on eMusic and download some of their albums from there. Not bad tracks, though they sound a bit too much like U2 tracks without vocals to me.